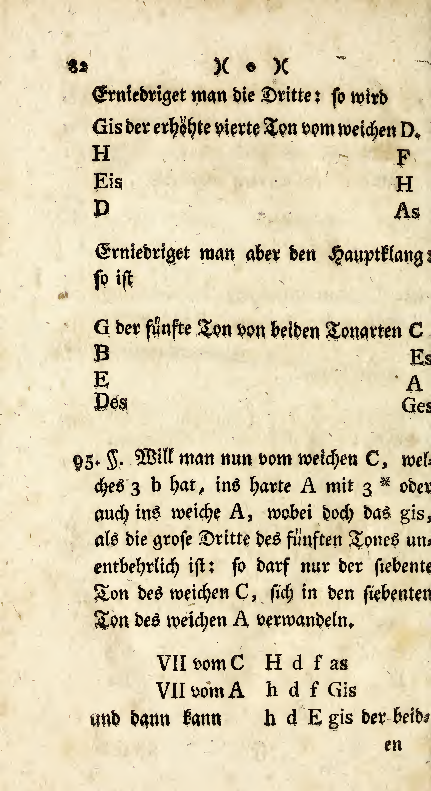 Gottfried Weber's Versuch einer geordneten Theorie der Tonsetzkunst (Theory of Musical Composition) (Mainz, B. Schott, 1817–21) is credited with popularizing the analytical method by which a chord is identified by the Roman numeral of the scale-degree number of its root. However, the practice originated in the works of Abbé Georg Joseph Vogler, whose theoretical works as early as 1776 employed Roman numeral analysis. However, the first claim is not cited and the second claim while pointing to In Praise of Harmony: The Teachings of Abbé Georg Joseph Vogler does not fully cite where in the book nor can I find the passage without purchasing the book. So is the claim about the origin of Roman Numeral analysis correct and if it isn't, who created the Roman Numeral analysis technique? To designate the scale-degree placement of these chords, Vogler introduced roman numeral designations. Although earlier theorists had proposed analogous notations and terminologies for identifying chordal scale degrees, Vogler was the first theorist to use roman numerals consistently. 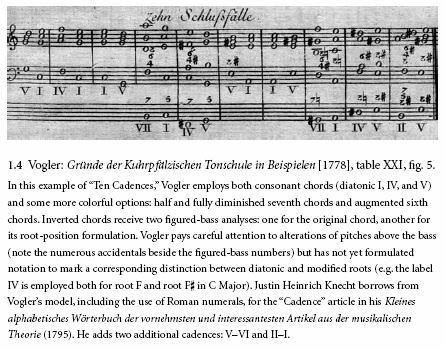 Properly speaking, Vogler designated only the leading-tone chord (VII) in his Tonwissenschaft und Tonsezkunst [of 1776] (p. 82). 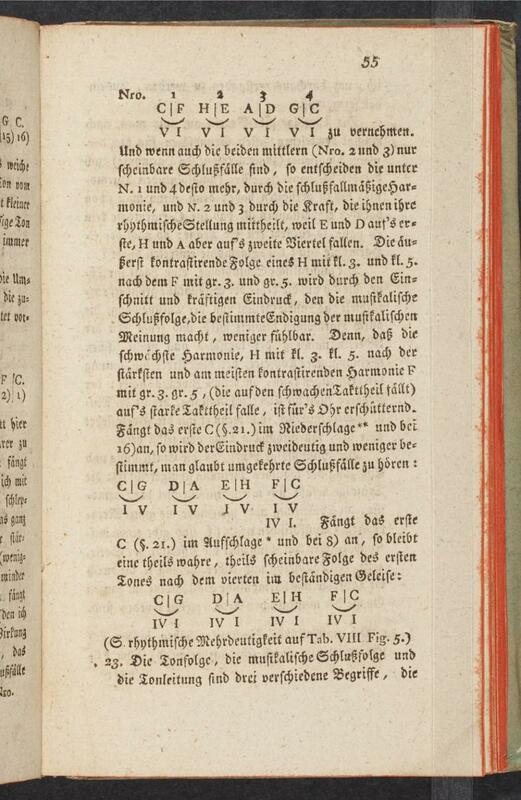 It was only in his later Handbuch zur Harmonielehre (1802) that he applied roman numerals to all scale degrees. Various writers invented analytical symbols to refer to the harmonies of a key. The Irish theorist John Trydell (c. 1715–76) proposed labeling chord roots by "harmonical figures" in 1766 (an invention disseminated via the 1771 edition of the Encyclopaedia Britannia); the German theorist and composer Abbé Vogler (1749–1814) used a few roman numerals later that decade; and Gottfried Weber (1779–1839) made roman numerals standard musical symbols in 1817. Now, as for what that all means. Notice how the above shows Vogler only using a single roman numeral, "VII," of two keys: C and A minor ("weich"). 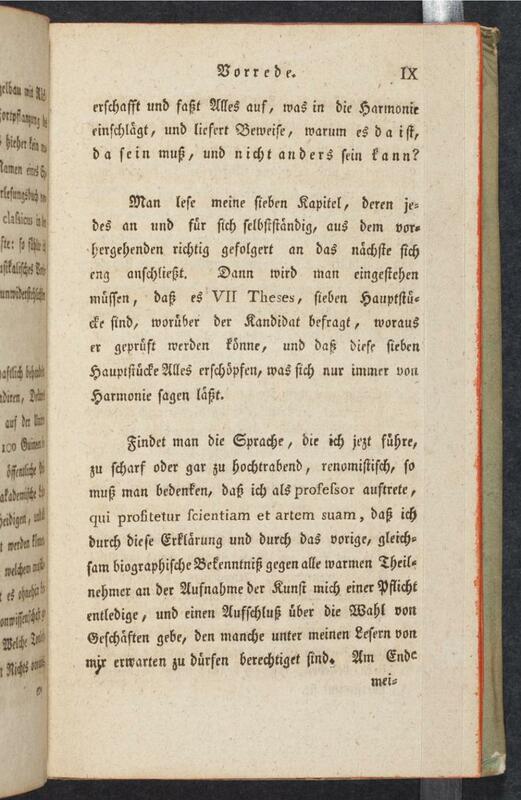 Dann wird man eingestehen müssen, dass es VII Theses, sieben Hauptstüfe sind, worüber der Kandidat brefragt, woraus er geprüft werden könne, und dass diese sieben Hauptstüfe Alles erschöpfen, was sich nur immer von Harmonie sagen lässt. In short: These seven chords exhaust all that Harmony has to say. 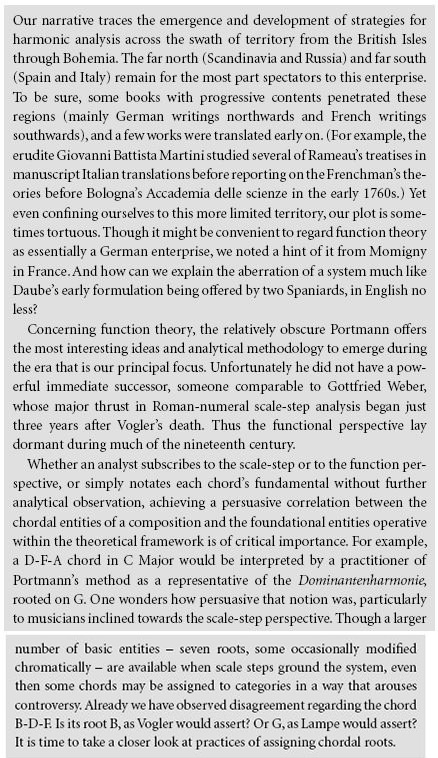 Less than two decades after Vogler's Handbuch, Weber publishes his Theory of Musical Composition. 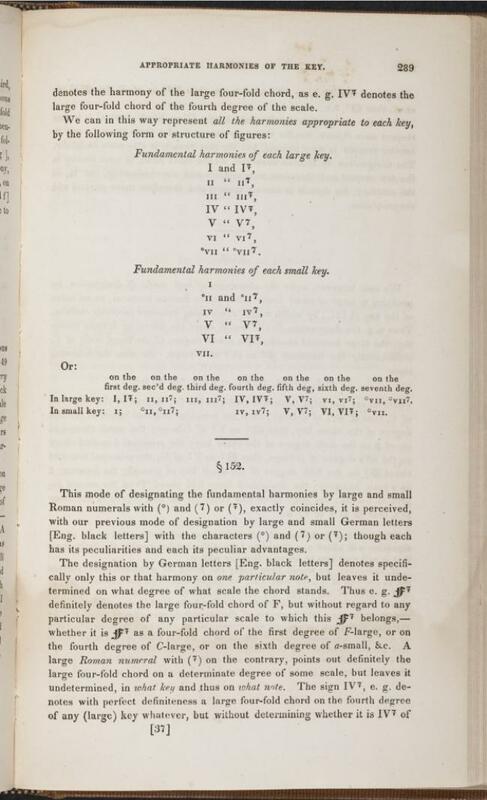 The following two images (from the famous English translation by Warner in 1846) should be clear enough, but the point is that here we see Weber distinguishing between uppercase and lowercase Roman numerals to show qualities of chords, which Vogler did not do. In short, it was Vogler that began using Roman numerals. Vogler's original use was only for a single chord (VII), but by 1802 he was using Roman numerals for every scale degree. But it was Weber that eventually made the system popular. Whether it was through the practicality of his modifications (uppercase vs. lowercase numerals) or the success of his treatise, his system would go on to appear in treatises by Richter and Sechter, and even have influence in France, Britain, and even America. 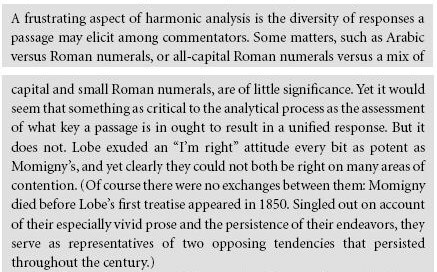 According to the book "Thinking about Harmony: Historical Perspectives on Analysis" by David Damschroder, the first person to use an idea similar to our modern system would be John Frederick Lampe in 1737. Back in those days chords weren't necessarily charted based on their roots but rather based on the bass notes that were written; what we now know as figured bass or, as stated at the time, thorough bass. 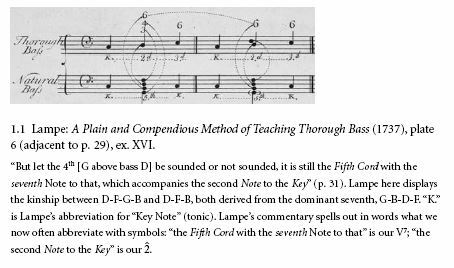 Here, Lampe outlines not only the thorough bass but also the natural bass, or the roots of the chords in their natural (non-inverted) positions. You can also clearly see how the tonic chord is marked with a 'K' and the dominant with a '5'. As the author states, today we would write this as I-V7-I. Here we can also see that indeed Vogler was one of the pioneers of using Roman numerals in such a way. It wasn't used in quite the same way, as you can read from the text, but it was very close. 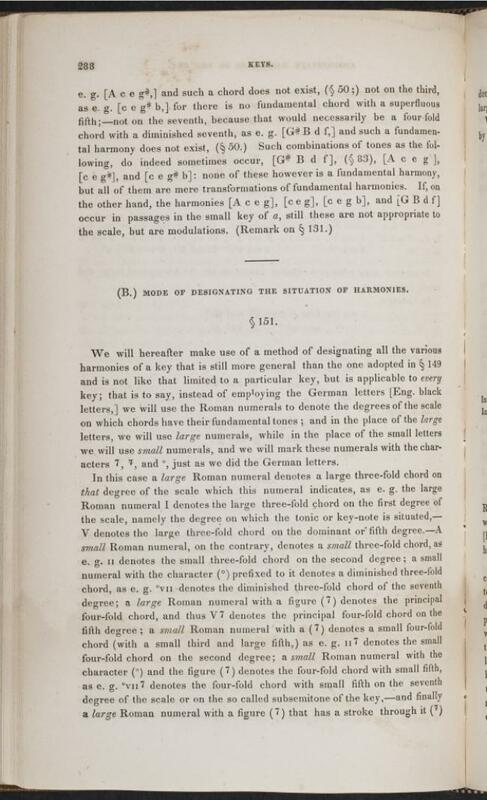 The author here suggests that it's not particularly important that Roman numerals were used for analysis (Arabic numerals were also popular) but that the change from writing thorough bass to analyzing based on chordal roots was a more important one that laid the foundation for the modern system that was most obviously laid out by Weber. 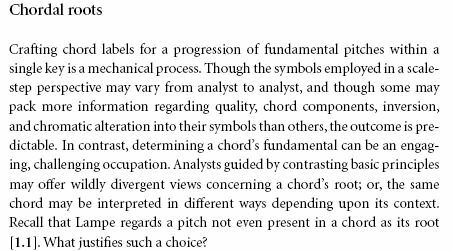 The book then goes on to explore the ways in which various musicologists have analyzed particular works and how the process is different based on who is doing it where, when, and what sort of functions each person expects a chord to act like. One example which was interesting to me was at the end of chapter 1 is an analysis of Mendelssohn's Wedding March and how many different interpretations there are of the first chord (A-C-E-F#) in comparison to the key of the rest of the piece (C Major). The book is a very interesting read on the subject and history of musical analysis and I would highly recommend it. Not the answer you're looking for? Browse other questions tagged theory notation history analysis roman-numerals or ask your own question. Analyzing an unfamiliar Roman numeral analysis?